UPDATE BULLETIN: Last week we attended two of the most popular professional Fairs in the educational sector that take place every year in the United Kingdom: Alphe and Study World. 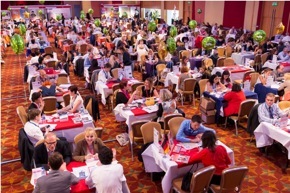 Universities, boarding schools, language centres and agents from all over the world met in London from the 4th September to 6th September 2015 for the Alphe UK fair and the 7th September to 9th September for the Study World one. All educators are fully accredited and agents are either members of a recognised association (such as English UK, who we are proudly members of), or can show that they are working actively and professionally. This means that everybody who attends is keen to do business and feels confident about the people they meet, creating a productive atmosphere. We had the exciting opportunity to meet new potential partner schools coming from many different places in the United Kingdom. Manchester, Bath, Brighton and Bristol are some of the new destinations that we are going to add to our new brochure for 2015 – 2016. And of course really nice independent language schools in different locations of the United Kingdom. We are now carefully choosing the schools that we want to work with in order to offer the best quality service as we always do. Our aim is to work with accredited independent schools that look after our students and adapt their courses to our student’s needs. If you want to know more about our new upcoming partnerships keep an eye on our social networks and our website! We will publish our new brochure very soon! It’s all very exciting. By worldchoiceeducation in Uncategorized on September 17, 2015 .